It’s not uncommon to get to a point in mathematics or programming that very large numbers must be dealt with. For the context of this post I will define a very large number (VLN) as any number that exceeds the maximum value of an unsigned 64-bit integer (aka ulong.MaxValue or 18,446,744,073,709,551,615). It’s surprisingly easy to run into a problem that deals with VLNs – often they will show up in programming when we are counting (a lot of) things or performing recursive calculations. In the post Investigating Basic Combinatorics, I showed that, without any intentional programming, we could not evaluate all nCn/2 for n >= 21 without exceeding ulong.MaxValue. Even with intentional programming, we saw that nCn/2 starts to break the VLN barrier when n > 67. One strategy to get around these constraints is to construct methods that deal with strings instead of numerical data types. Since String.Length has data type Int32, the theoretical character limit of Strings in C# is 231. This means that the theoretical maximum of a number in base 10 that can be expressed by a string is 10231 – 1. If that scale isn’t impressive, consider for a moment that the observable universe contains somewhere between 1079 and 1080 atoms. Such a scale for significant digits would cost an unprecedented amount of time in processing. For the sake of simplicity, we will generalize these limits and assume that strings do not constrain us to an upper limit for integer values. In this post, I intend to address a strategy for dealing with the addition of integer type VLNs. Future posts will show how to extend the functionality to work with non-integer rational numbers and address multiplication, division, exponential, and combinatoric operations. We can apply a programmatic approach to the pseudo-algorithm above. If we write an integer as a string, then the last digit of the string will represent the units digit. Since C# uses 0 based indexing, the maximum index is the Length property less 1. 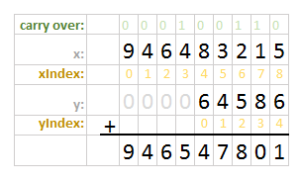 We will loop through all the digits of both numbers, starting at with length – 1 index (unit) of each. We have to account for different lengths of numbers, so we will capture the maximum length of the numbers. During iteration, if the count of the current digit exceeds the length of the smaller number, 0 will be assigned to the smaller number’s digit. The carry over will be assigned a value of 1 or 0 for each set of digits depending on if the current sum is greater than 9. A proposed method looks like the following. Some liberties with verbosity have been taken to ensure readability. 100,000 tries of adding two numbers with 61 significant digits with this method executes in 2.6432 seconds. The next post in this series will focus on multiplication and exponential operations of very large integers. Armed with such operations, we will be able to explore combinatorics on a more interesting scale without the need for advanced knowledge of mathematics or programming. getDigitFromXAtIndex(x,i). Because addition will happen from right to left. Similarly for yUnit as well. Hi Nikhil, what you are suggesting is not correct. The function getDifitFromXAtIndex works backwards on the string (char array). That is the purpose of the x[x.Length – 1 -y] portion. However, this method could be written cleaner or even broken up into two methods. Oh yes you are right ….My bad !!! Anyways for sharing these stuffs. These are really helpful. Can you explain the concept behind x[x.Length – 1 -y] and that particular method.